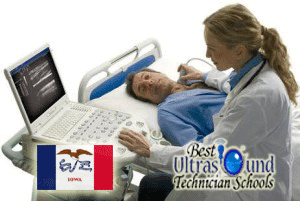 The state of Iowa has three institutions of higher learning accredited by the Commission of Accreditation of Allied Health Education Programs (CAAHEP) that offer ultrasound technician programs. University of Iowa (IA)--based in Iowa City and known as the oldest university in the state--offers its Bachelor of Science (B.S.) in Diagnostic Radiology program to its students through its Department of Radiology department. The program is also accredited by the Accreditation Council for Graduate Medical Education (ACGME). Allen College, which is based in Waterloo, has a Bachelor of Health Sciences degree in Diagnostic Medical Sonography. The third school, Mercy College of Health Sciences (MCHS), is based in Des Moines. It offers a less elaborate, Associate of Science degree in Diagnostic Medical Sonography. The IA program is the most advanced of the three, with more than 100 credits to take from a four-year curriculum. The DMS program at MCHS has a curriculum that can be completed in two years, each of which consists of Fall, Spring, and Summer semesters. The one at Allen College is the shortest, designed for completion in five semesters condensed into 21 months (1 3/4 years). Each program includes prerequisites, with MCHS providing the most basic ones (English composition, human anatomy, college algebra, etc.). Students can expect to take courses in subject areas that include bioethics, diagnostic procedures, ultrasound and CT scans, pediatric radiology, and pathopsychology. Also included are laboratory classes for students to acquire hands-on experience. At IA in particular, students take part in medical conferences, prepare ethics cases, and work on physics and diction modules. According to a 2012 report by the U.S. Bureau of Labor Statistics (BLS), diagnostic medical sonographers in Iowa made a median annual income of $57,500 ($27.66/hour) that year. The bottom 10 percent made $44,300 a year ($21.32/hour), while the top 10 percent made $73,300 ($35.22/hour). In 2010, there were 540 diagnostic medical sonographers working in Iowa, according to the BLS. The agency predicts a 42 percent job growth for the profession in that state between 2010 and 2020, thus bringing the number of professionals to 760.